We were in Bernau with my cousin Erika for three days, mostly catching up on some R&R - traveling is not a restful activity. Did I mention that German pastry is delicious? We particularly like it because it often is not sweet. When we went into town, we always bought a pastry - we managed to have some every day. The apple strudel is great. On one of the days, the three of us made one trip to an Austrian Alpine lake of Wahlsee. The lake is tucked in between rugged and craggy mountain peaks, some peaks with lingering snow. Since the lake wasn't too large, we walked around it and at the finish, rewarded ourselves with a tasty locally-caught grilled fish. Early on the fourth morning, the three of us took off for Prague. We had a quick change of trains in Munich. One of the things you have to watch out for when getting on a train is that not all cars of a train necessarily go the same city. For Prague, only the last four cars were set to go. It's good to pay attention to these small details. We had heard that in Prague, you have to watch for pickpockets, street money changers and unscrupulous taxi drivers. After arriving in Prague, we quickly encountered the first of those - a taxi driver. He asked us what hotel we were going to and after telling him, he said it would cost fifty Euros! Yet it was less than a mile away. But it turned out to be a mistake to walk to our hotel near the Charles Bridge, instead of figuring out the tram system. What seemed to be so near took us nearly an hour to walk because of all the narrow, winding cobble stoned streets, some with dead ends and some curving a half-circle back in the wrong direction. The streets were crowded with tourists. But we finally found Hotel Certovka and were pleasantly surprised - it was a very nice, centrally located hotel on the west side of the Vltava River (German's called it the Moldau) near the end of the Charles Bridge. After getting settled in, most definitely the first order of the day was to find a half liter of some good Czech beer. 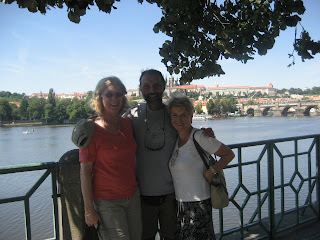 Prague (or Praha) is divided into different sections mostly by the Vltava River. There's Old Town, New Town, Lesser Town and the Prague Castle area. Prague was settled by Slavs and Germans back in the 7th to 8th centuries. But the city didn't really start evolving until the 12th century. Our hotel, being that it's on the northwest side of the river, is in the Castle area. It's surrounded by historic, narrow, winding cobble stoned streets with lots of cafes, bars and small shops. We saw most of the major sights including the Prague Castle complex and Wenceslas Square, where in 1989 there were rallies held there that made it the epicenter of what became to be known as the Velvet Revolution. We also visited the St. Nicholas cathedral, and of course the Charles Bridge which we looked out on from our hotel room. 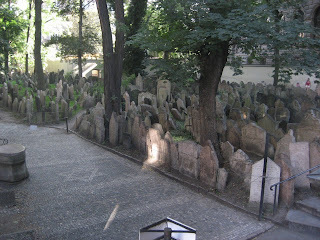 Although we didn't go into the Old Jewish Quarter museum, we did walk around the area and saw the old and the new synagogues and the macabre-looking cemetery, with the headstones all askew. From what we read, it described the cemetery having as many as 12 layers of buried bodies. This was mostly due because over time, the Jews were confined to a smaller and smaller area. The cemetery was quite a sight to see. The astronomical clock is a well known sight in the city's square. Although it attracts lots of visitors each timer it rings, we were not that impressed. But the legend is intriguing. Supposedly, after the clock maker finished his masterpiece, he was made blind by the city's elders so that he could not replicate the design elsewhere. As a means to revenge that act, he later threw himself into the giant clock's mechanism, killing him and breaking the clock. It took over hundred years before someone came along who figured out how to fix the clock. The Prague Castle is an exceedingly huge complex built (and re-built) over time dating back to the 12th century. It sits majestically on a hill overlooking the Vltava River. It dominates the entire city of Prague. In essence, the castle is a city within a city of which its most impressive building is the Gothic cathedral, which for centuries was the spiritual center of the country. The shear size, height, beauty and scope of the cathedral is comparable to (or may exceed) the Notredame Cathedral in Paris. The other highlight in the Castle area complex is a small street named Golden Lane. It's made up of a row of tiny houses where the king's 24 marksmen lived. Today, the houses are souvenir shops - but you get the idea. 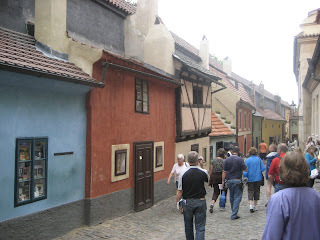 Prague has numerous narrow streets. We tried to take different routes each time, partly to avoid the crowds and partly to discover different sections. You'd get a completely different perspective just a few streets away from the main thoroughfare. Plus, we'd continually run into new and unusual sights, tucked in behind an alleyway. We did a little bit of wine tasting, but unfortunately, the best place I found to taste wine, was the one we happened upon on our last evening in Prague. We tasted some excellent whites, including a Muller Thurgau, a Chardonnay and an Pinot Blanc. With the reds, I was really impressed with a Pinot Noir from the Morava region with hints of red cherry and a spicy white pepper. It was a big pinot with 14% alcohol. I also tasted their house red, that was inexpensive but was very tasty. An interesting comment that the winebar owner made, as I was tasting, was that Czech wine makers need luck with the weather to make their wines. The impact of the weather is such that it's difficult for them to make a consistently good wine each year. Other memorable sightseeing was a walk to one of the islands on the Vltava River, a ride on the funicular up to hill overlooking Prague, and hunting up what's called the John Lennon Wall. Apparently, he was not liked by the authorities back in the Communist era, and thus the music of the Beatles was prohibited. The wall is not really that impressive but it is colorful and has lots of lyrics of Lennon songs. We spent four nights in Prague. 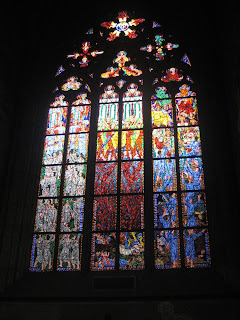 It gave us a good feel for the city but it also gave us the impression that we needed much more time to see it all. It was now time to board a train to Berlin.